Magnificent Beachfront Locale . . . Just Steps To The Sand! 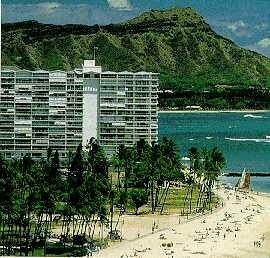 Just steps to the Golden Sands of World-Famous Waikiki Beach, you’ll marvel at the Breathtaking Panoramic Ocean Views of the Sparkling Blue Pacific – with Diamond Head at your back door – from the Private Lanai of your own Elegant Vacation Condominium Suite at the beautiful Shore. With it’s perfect Beachfront Locale and all of Waikiki at your doorstep – showcasing an international array of world-class shops, dinning and exciting entertainment moments away – your vacation Oasis will simply captivate all your senses! Relax in the Privacy of your own Spacious Studio, One or Two-Bedroom Vacation Residence tropically decorated in a deluxe Island-Rattan motif, while the call of the Pacific invites you to soak up the golden sun and take a refreshing swim in the Emerald-Blue and crystal-clear warm waters of Waikiki Beach. Additional appointments for your pleasure showcase expansive Lanais ideal for lounging and marveling at another breathtaking Golden Sunset, fully equipped kitchens (kitchenettes in studios), in-suite washer/dryers, color Cable TV..
Take a dip in the shimmering pool, enjoy the poolside Sports Bar, soak in the Whirlpool Spa after a workout in the fitness Center, and enjoy Dining and Entertainment in our Restaurants and Lounges. Welcome to the Shore…the Perfect Beachfront Getaway Locale on world-famous Waikiki Beach. SIZE: This Beautiful Vacation Oasis offers your choice of either Romantic Studios simply ideal for 2 Guests; Spacious 1-Bedroom Condominium Suites that are approximately 900 Sq. Ft. and comfortably accomodates 4 people; Or Deluxe 2-Bedroom Vacation Rentals (limited availability) ranging from 1150 to 1575 Sq. Ft. that sleeps up to 6. All Linens and Towels Provided.